So, my daughter was an archeology major in college and really got into the study of bones, specifically human bones or human osteology. 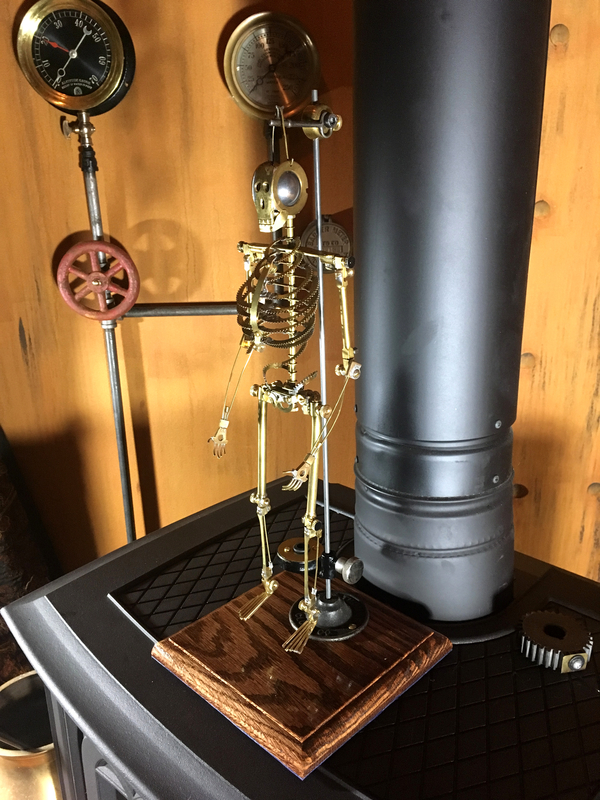 Recently she asked me to make here a steampunk inspired skeleton that she could display as an art piece. 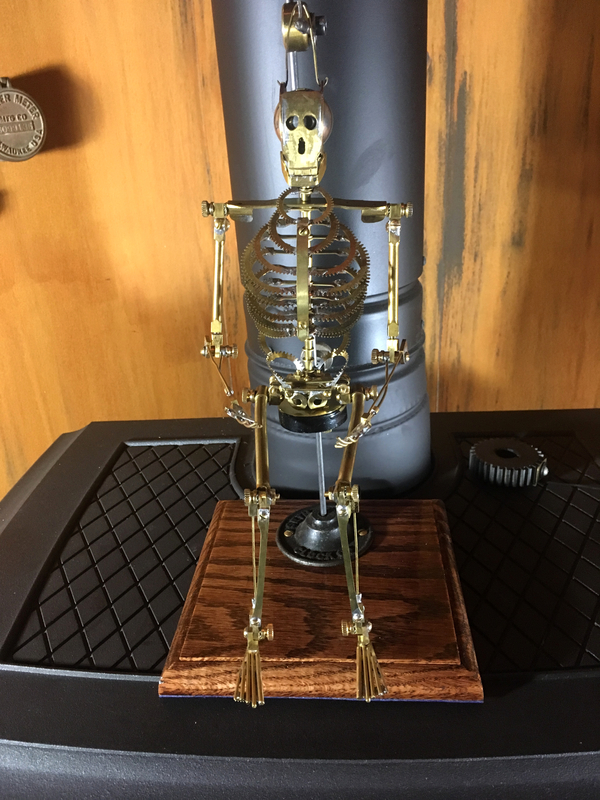 I told her I would make one for her for Christmas provided she didn’t expect me to put in all the bones that are actually found in a human skeleton. I also told her that I wouldn’t make it actual size. In this blog I intend to chronicle the progress I make in this project. I am starting by making the skull and will work my way down the body from there. I expect my skeleton to be about 16 inches tall when completed. I found these pictures that I will use as guides in creating my skeleton. I am starting with a 1.25 inch diameter ball bearing and two brass covers that were originally used for the coil springs of an antique clock. The covers were chucked up in my lathe and the inside turned to a diameter that would fit part way over the ball bearing. The brass washers that resulted fit part way over the bearing leaving about a 3/4 in gap between the washers. A face plate was fabricated from 3/32 inch brass plate. The brass pieces were all sanded and rosin was applied to surfaces I intended to solder together. The face plate and skull assembly were all held in place with a vice and two pipe fittings for soldering. A brass plate was also mounted to the under side of the skull where screws were inserted. One screw will act as the spine, the other will hold the lower jaw in place once it was made. The skull assembly was then cleaned up using files, a Dremel tool and sand paper. Next up will be the fabrication and mounting of the lower jaw. I have a lot of brass plate material salvaged from old clocks. I plan to use these to make many of the flatter pieces of the skeleton. I used a template I designed and cut from paper for jaw shape. This was laid onto the brass and the edges marked. A metal band saw was used to cut the rough shape using the edge marks as a guide. After a lot of filing, bending and Dremel work I arrived at the basic shape above. The jaw is held in place here with a piece of tape. Notice the “beauty mark” left on the chin from a whole in the clock brass. A brass tang was made and soldered to the inside of the jaw. The front screw post added when the top of the skull was made was used to secure the lower jaw in place. Brass wire taken from my clock scrap was used to make a loupe that can be used to hang the skeleton for display. Another brass plate was used to fashion the shoulder piece. The shoulder blades were created by bending the to ends at 90 degree angles from the top of the shoulder. The neck is made from brass tubing and #6 washers. These and shoulder assembly are slid on and held in place by a 6-32 brass nut. The actual shoulder joints were made by boring and threading some brass rod. The arms will be held on using 6-32 brass screws. The shoulder joint rods were then soldered into the angle of the shoulder blades. The completed shoulders ready for mounting to the spine and receiving arms. With the shoulders mounted to the spine, screws are in place that will eventually hold the arms. The neck vertebrae have been cut to a consistent length of 1/4 inch from brass tubing. #6 washers act to delineate each vertabre section. The brass fitting in the middle of the spine holds the two pieces of 6-32 threaded rod together creating the full length of the spine. These are the connector pieces fabricated for the U-joint shoulder/arm attachments. Connector pieces attached to the shoulder. The screws are temporary. A screw with a knurled head will be used so the joints can be adjusted without tools. The humerus bones were made from quarter inch square stock. The center sections were turned on a lathe to a round form. One end of each humerus was bored out to accept a shaft for the elbow. The other end was drilled and notched for attachment to the shoulder connector piece made above. The shoulder U-joints completed and attached to the skeleton. Elbow joint pieces were fabricated. A small brass rod was inserted into the elbow and soldered in place. When completed these pieces slide into the elbow end of the humerus. This will allow rotation at the elbow. The forearm end of the elbow connector was milled and drilled so that it will be able to accept the next are sections. The radius and ulna. A small set screw was added in order to hold the rotation shaft inside the humerus. So here we are so far. You will notice I’ve done some minor modifications to the “final” product. Knurled nuts and screws gave been added as the attachment methods for the shoulders. 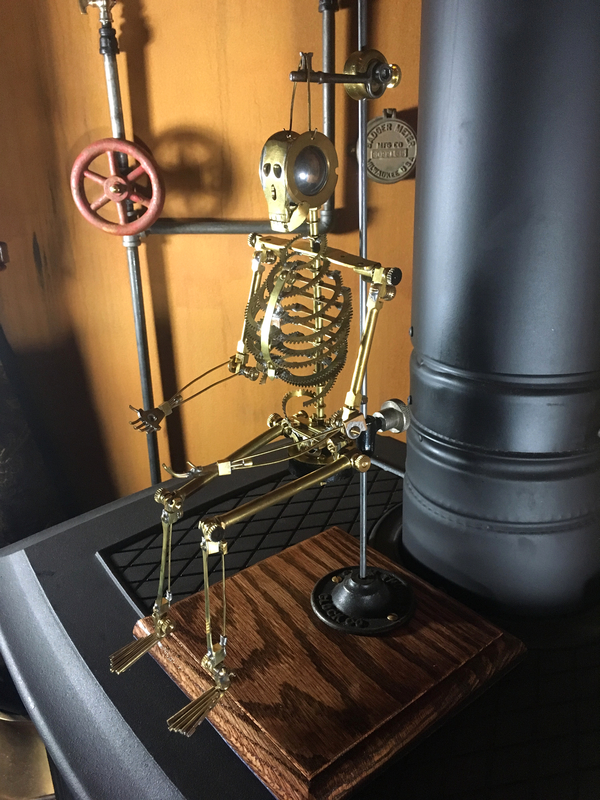 When completed the skeleton will be fully articulated and adjustable by loosening and tightening various screws/nuts on each joint. You will also notice that I opened up one side of the slot on the top of the humerus. This allowed the joint to be less bulky, and the set screw work better. Next up will be the radius and ulna assembly. I have some ideas, so we’ll see where that goes. These pieces are parts from an old clock. They are the brass shafts and cams that the trip hammers were mounted to. The allowed the hammers to strike the chimes in the clock. I’m going to use them to create the hands, radius and ulna of the forearm. The hands were fashioned from the cam pieces above and some 1/16th in brass rod. The rough hands are shown on the left. On the right are the completed hands with a shaft for inserting in the wrist. The wrist will rotate around this shaft. A small connector piece was fabricated from brass and drilled to fit the radius and ulna. The elbow, radius and ulna used the clock trip hammer shafts shown above. The wrist was soldered to the radius and ulna. The hand is inserted through a centered hole in the wrist. On the left a brass screw was soldered into place at the elbow. The hand shaft was inserted into the wrist and cut to the proper length. A small brass disk was soldered to the end of the shaft. This holds the hand in place while allowing rotation of the hand at the wrist. Small brass donuts were fabricated. Each will hold one of the ulna bones to the elbow. The donuts are shown here after being soldered to the ulna. The picture on the left is the completed elbow assembly attached to the elbow rotation joint shown in an earlier section of this post. Some close up views of the completed arms on the left. The skeleton as of today on the right. Next I’ll be working on the rib cage. 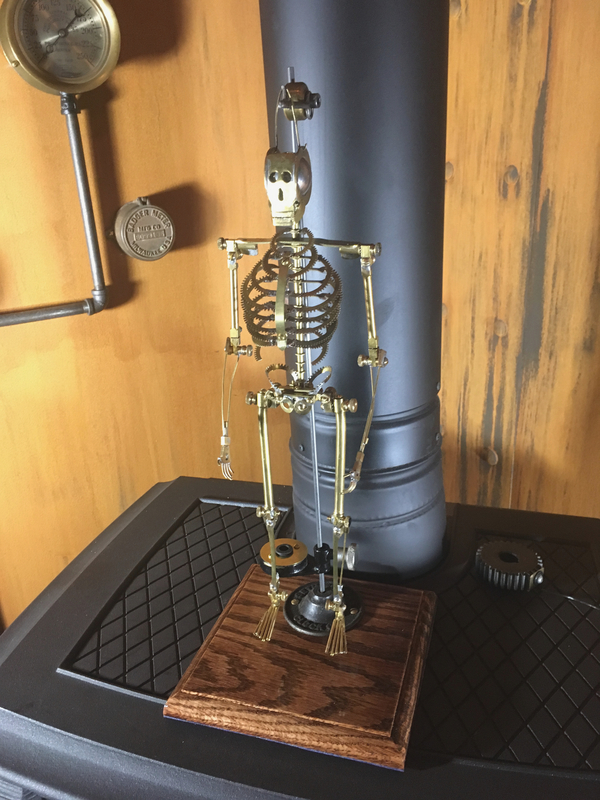 The rib cage will be made by modifying brass clock gears. To do this one gear will be used for each rib. The center spokes of each gear is removed and then the gear is cut in half. The ends of the pieces are then tinned with solder as the hole rib cage will eventually be soldered together. Because ribs are not circular spacers are made of varying lengths that will create ovals when soldered to the gear ends. The spacers were made from 0.032 inch by quarter inch brass. The tips of the spacers were bent/twisted to 35 degree angles on each end as human ribs slant downward. The ends were then tinned. The rib gear halves were then soldered in place creating a rib. After a coupled ribs were created a test mounting was done on the skeleton. On the left is my rib assembly line. On the right are all the ribs in a fixture used for soldering. The rib cage was made in two sections. The top section mounts to the upper piece of threaded rod that serves as the spine. The connector nut attaches the lower piece of spine(threaded rod) and then the lower part of the rib cage is slid on. An inner breast plate was soldered in place using quarter in brass stock. This holds the spacing between each rib. When completed the rib cage was slid onto the threaded spine of the skeleton. Additional brass vertebra were added and the whole assembly temporarily held in place with a wing nut. An outer strip of 0.016 inch by quarter inch brass was screwed to the inner breast plate creating a more finished outer breast plate. The skeleton from the back. Note that more brass tubing was cut the 1/4 inch lengths creating vertebra. The wing nut on the end temporarily holds everything in place. The tab on the back of the shoulder plate was removed and a new hole was drilled further forward. This is the hole the spine passes through. Moving the spine forward allows the plate to fit between the top two rib sections. This is a close up front view of the repositioned rib cage. Back view of the redesign. Full view of the skeleton so far. Next time we’ll start on the hips… Really… Unless I decide to redesign something else. I contemplated the hips for a day or two and decided that it might be easier to come up with a plan if I had the legs at least started. That way I could lay things out and maybe get some inspiration for the hip design. Let’s face it human hips just have a weird shape. For the femurs I will be using some 3/8 inch brass rod. The rod was then cut to length and faced on the lathe. A small hole was bored into ends of the rods so the femurs could be mounted on the lathe using a live center. Each femur was then turned in the center to 300 thousandths of an inch along the shaft. The ends were left at a full 3/8 inch (375 thousandths). One end of each femur was bored and threaded to accept a 6-32 set screw. These are the femurs with the brass set screws with knurled ends threaded into the ends. The threaded end was faced off on the mill and a 3/32 inch hole was drilled perpendicular to the length. A brass shaft will be connected to the hip assembly when it is made. The top of the femur will slide onto this shaft and be held in place by the set screw in the top of the femur. The other end of the femur was cut with a 1/8 inch end mill. The notch in each end will accept the tibia and fibula bones of the lower leg. This picture shows the view of the completed femurs laying roughly in the place where they will mount to the hips. The brass rods at the top of the femur will be soldered into the hip joints. The set screw can be loosened to set the forward/backward position of the leg. After completing the femurs, actually while working on them, I did come up with a solution for the hip assembly. That will be the next phase of the project. This is the sketched plan I made for the frame that I will use for the base of the hip assembly. It will be made from quarter inch square brass rod. I don’t normally draw up detailed plans, but I needed two different hole sizes here with some threaded and some not. The plan helped keep this all straight. The brass was cut to the rough length and then the ends faced on the mill. The holes were drilled and some tapped to accept 6-32 screws. The center part of the frame was screwed and soldered. The shafts for the femurs were inserted into the side bars and soldered in place. The femurs slide onto the shafts of the side bars. In this way the hip joint can be articulated forward and back as well raised to the side. This is a full view of the hip frame attached to the spine with the femurs attached. The next step is to add some façade pieces to the frame to make it look more like a hip. Two small brass gears were cut and bent slightly. These will be attached to the insides of the side bars of the hips. This will represent the side part of the ilium. The gears were then soldered in place. Knurled head screws were made to act as set screws for the top of the femurs. Holes were drilled into the front and back bars of the hip frame. These will be used to mount additional façade pieces. This is where I’ll be working next before moving on to the lower leg. Two one inch diameter brass spring washers from an antique clock were drilled and cut. These will be used to make the ischium rings seen on the bottom of the hip bone. The two washers were attached to the front of the hip frame with two 4-40 brass screws. The slot cut in each ring allowed the ischium to be bent back on the outer edges. The back of the ilium is made from two solid gears notched and bent at a slight angle. Holes were drilled on the short edge of the bend for mounting to the frame. The completed hip assembly with the ilium and ischium attached. A close up of the hip assembly mounted to the spine. The skeleton thus far with the hips and femurs attached. Next I will be completing the lower portion of the knee joint and than coming up with tibia and fibula. 10-14-17 Well, The more I looked at it the less I liked the hip design. It was too bulky and boxy to fit with the rest of the design, so I decided to do it over. This is the new plan for the smaller hip assembly. It will be made from three pieces of quarter inch brass stock. The ends of the pieces were faced on the mill and holes were drilled to accept 4-40 brass screws. The center shaft was notched on the mill to accept the joint assembly. On the right is the new hip base. I used the ischium (brass rings) I developed for the old hip assembly as it was about the only thing I liked. I’m not sure about the scale here, but I will leave it for the time being. The hip joints were made from small brass lengths drilled perpendicularly. One hole will accept the 11/32 inch shaft for attaching the femurs to the hips as before. The other hole will allow a 6-32 brass set screw to pass through for attachment to the hip. The hip joints with 11/32 inch shafts soldered in place along with some washer spacers. This is before cleaning the excess soldering rosin off. Brass nuts were soldered to the center shaft to allow for threading the set screw through the notches. The new hip assembly. The holes in the top allow mounting to the spine and attaching the new ilium. The ilium new were made from gear rounds I had originally cut for the ribs. They were bent around a mandrel and soldered to mounting pieces made from 1/4 inch by 0.016 inch brass stock. The ilium were soldered to a central bar made from the same 1/4 stock used above. This bar will be used for mounting the ilium to the hip assembly. The completed hip assembly with ilium and ischium attached. Still not sure about the ischium pieces. (brass washers). I also thought the femurs as currently formed looked to straight and stick-like. I decided to give them a slight bend. This will give them a more natural appearance. The femurs were bent in a vise using a length of black pipe to force the bends. Each femur was bent on the hip end to an angle of about 5 degrees. Everything done so far with the new hips and bent femurs attached. Another view. Now I will be moving on to the lower portion of the knee joint, tibia and fibula. Four brass joint pieces were made from quarter inch stock brass. Two will serve as the upper part of the ankle joint and two will be the lower part of the knee. On the right are two attached to the femur at the knee. The fibula will be made from the same clock trip hammer parts used in making the radius and ulna of the lower arm. On the right is the completed fibula after cutting and shaping. The tibia were made from 1/4 inch brass strips that were drilled and shaped to there final form on the right above. The tibia and fibula were mounted to the joints with small 4-40 brass screws. Each joint piece had been drilled and threaded to accept these screws when the joints were made. The final pieces were all soldered in place. The lower end of the fibula used a electrical connecter that was soldered and screwed to the ankle joint. The completed tibia and fibula attached at the knee to the femur. One final view. Just the feet and toes to complete and this project will be done. I did another slight redesign. The femurs previously slid onto posts on the hip joints. The were held in place by a set screw in the top of the femur. This is the old design where the femurs slid on to the two shafts. This worked okay, but the set screws were not stiff enough to hold the femurs in place when set at an angle against gravity. In the new design the shafts are replaced with a 8-32 brass screw that is soldered into place. A star washer and knurled nut hold the femur in place. In fact I have replaced all of the split washers I used in the joints with star washers. This tightens things up considerably. On to the feet. These are some clock parts that are about the right size to work as the base for the feet. A lower ankle piece was fabricated that allowed the post of the feet to be slid inside and held in place by a set screw in the heal. The ankle piece attaches to the leg with another soldered in place screw and a knurled nut. Unless I wanted two left feet I needed to flip the post to the other side on one of the feet. That would be the one on the left. Here we have both feet attached to the legs. The skeleton crouching with the feet attached. And here we are today about one month from the start of the project. All that is left are the phalanges and metatarsals (toes). Oh, and of course a stand. I changed the angle on the ilium so they would better mimic a real hip shape. As I stated before I was not sure about the scale of the ischium rings. I fabricated a new set just to see how they would look. I think with the new ilium angle and the smaller scale ischium rings the hips have come together very well. I will leave the new ischium. The center spar of the hip joints is the bar on the left. The joints, one on the upper right, slide into the channels on each side of the spar and are held in place with screw that tightens into the nuts soldered to each side. This isn’t working very well with the finger tightening knurled screw heads I am using. The bar on the right will be fabricated into a fix. The new spar on the right uses a notch instead of a channel. This allows star washer to tighten directly onto the joint attached to the femur. This holds the position of the joint much more securely. 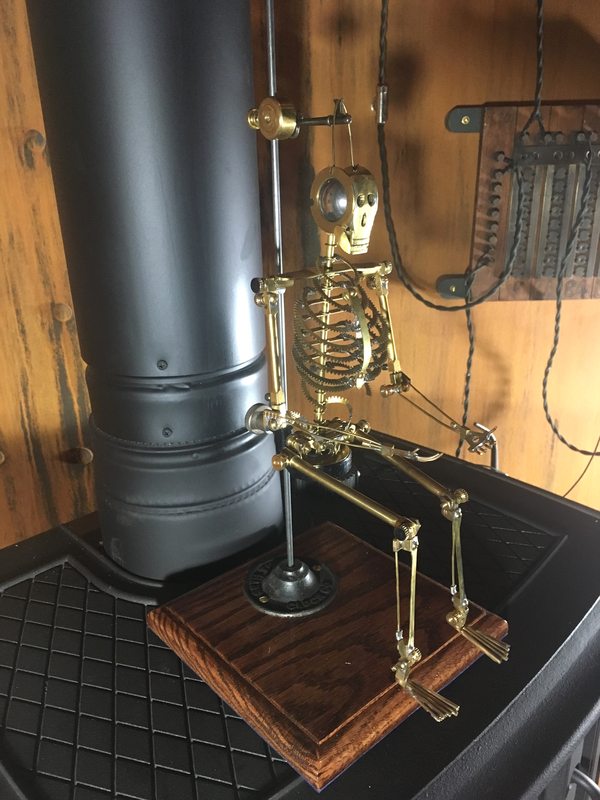 The skeleton sitting patiently on my work bench waiting for it’s feet. Time to add the toes to the feet. First I trimmed the feet to the with that fit to the scale I have been using. Then I cut some brass rod to fit the correct length for each toe. Then the toes sections were soldered to the feet. Here are both feet completed and cleaned up. The feet attached to the legs. Other than some finishing touches this is the completed skeleton. I will work on a stand next and then do some detail stuff and the project will be complete. As a finishing touch I painted the heads of the knurled screws black on the flat surface. The base of the stand is made from a square piece of oak. The edges were rounded using a router. A center hole was drilled for inserting a rod to hang the skeleton from. The central hole was reinforced with a brass plate. The oak was sanded, stained and varnished. I added a key way to the vertical shaft so it would be more stable when inserted into the base. The metal rod will be held in place by the mounting bracket for the chime of an antique clock. Stick on blue felt was applied to the bottom surface of the stand. 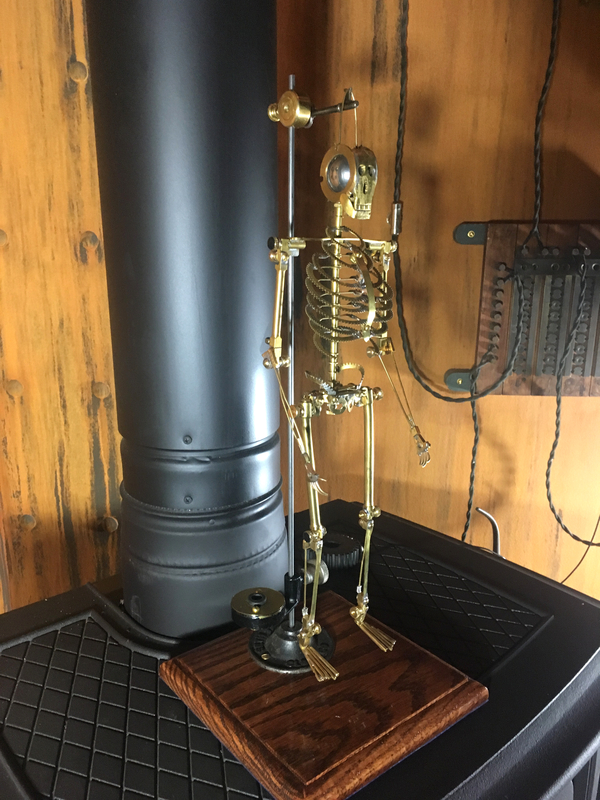 The stand will be made so the skeleton can be hung from a hook or seated. The seat will be made from this lighting mount taken from an old “magic lantern” projector. A brass plate was added to the seat and a hole placed in the center. The hole has a rubber grommet inserted. This allows the knurled nut on the but of the skeleton to be held in place while sitting. These are the mounting pieces for the stand. To the left is the completed seat. The piece on the top is the hook for hanging the skeleton. You’ll notice I couldn’t resist making the hook from a skeleton key. The rod is in the front with the mounting bracket directly above it. Completed skeleton hanging from the stand. For comparison, the picture I used as the plans. The skeleton has reached completion. It took a little over a month to complete. I would estimate 80 to 90 total hours. My next project is a steampunk butterfly.